As part of our efforts to bring the publishing community together, we launched The Storytellers: a blog series where we interview some of the most accomplished thought leaders from across the industry (Keywee friends and customers like Gear Patrol, Salon, and Complex) and share their insights. 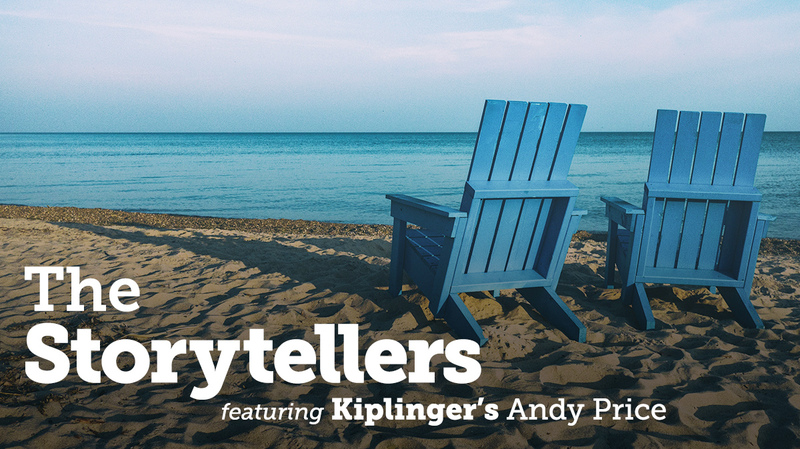 Recently, we got the chance to sit with Andy Price, the Director of Digital Operations and Advertising at Kiplinger, where he’s worked for almost ten years. While Kiplinger is approaching its 100 year anniversary, it’s anything but a “legacy” publisher. Andy’s team has been at the forefront of implementing new technology, user experiences, and products across the company. In our conversation, he shared details of that process, as well as thoughts on “owning” your audience, measuring success, experimenting with new revenue streams, and the importance of brand reputation. Below is our interview with Andy. Can you tell me more about your team at Kiplinger? What are your major responsibilities as Director of Digital Operations and Advertising? My team is made up of five salespeople and two operations people. 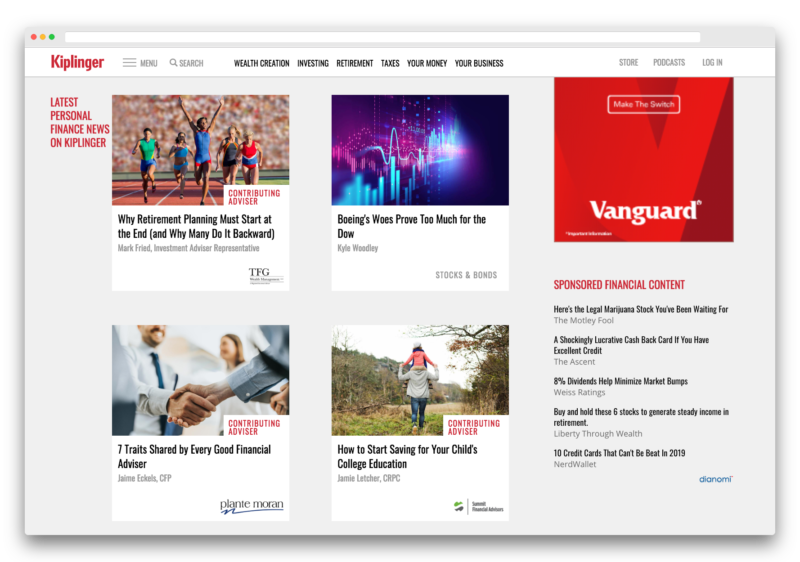 The salespeople historically had been divided into digital-first and print-first, but over the years the structure has evolved, especially with the growth in native advertising. Now everyone sells the full range of our products. I’d say my main responsibility is keeping us informed of industry development and making sure we’re adapting to industry standards. In the past, the manager of the revenue team was a salesperson, but since I took charge of this department a couple of years ago, we’ve really been focused on operations and technology. We’ve implemented new technology around programmatic, header bidding, audience verification, and we’ve also driven internal changes to improve revenue like analyzing user engagement and launching new page templates. What metrics do you and your team use to measure success? In terms of success, revenue is always king. But we’ve become much more sophisticated with our metrics. We used to really focus on just direct sales back in the day: whether they were up or down in any particular month, and why we thought they were up or down. In the past couple of years, we’ve really shifted towards getting more visits to our site, more engagement, more retention, and improving the quality of the user experience to get people to come back to the site and consume more content. You’ve been at Kiplinger since 2010. You’ve already mentioned a few shifts that have happened while you’ve been there. How else is Kiplinger different now compared to when you started? In general, there’s been a big shift toward a more technical focus, not just on the revenue side, but the editorial side, too. We’ve all had to keep up with technology and learn about HTML, and lazy-loading assets, and page speed, and viewability, and servers. There’s also more collaboration with the editorial team and the development team. We work closely with the editorial director to figure out how to implement ads in a way that creates the best user experience and makes people happy to read our content. What are the factors that you consider when balancing revenue generation with a positive user experience? What does that process look like? There’s definitely a trade-off between long-term goals versus short-term goals. There are always things you can do to generate more revenue in the short-term. For example, with email, we could send out some more aggressive advertising in our emails or we could send more frequently, but we’d see more opt-outs. So it’s important to keep the long-term growth in mind when we’re looking at new revenue opportunities. When we’re considering a new unit on the site, I try to take myself out of the revenue mindset and stop thinking about the numbers and just think about what the experience is as a user. I try to ask myself, ‘What would I be comfortable presenting to Mr. Kiplinger as something that’s a good experience on our site?’ Or, often, I’ll ask my daughter or my husband to go to a page that has the ad unit in place and I’ll ask them what they think of it. We’re really focused here on our quality and reputation, especially because a large part of our business is direct sales. Part of that effort is on the editorial side, but part of it is making sure that people coming to our site aren’t being bombarded with ads they find intrusive. We’ve been around for almost 100 years, so people really know us as a reliable and trustworthy source, and we’re working hard to continue that reputation. What are some of the biggest challenges you’re facing right now? Do you think these challenges are unique to Kiplinger or do you think others in the space are facing the same hurdles? Like I mentioned earlier, keeping up with technology is one of our biggest challenges. I’d say the second is meeting advertiser demands fast enough. We have a lot of direct advertising, and sometimes our clients will demand things that we didn’t foresee. We try to be ready for all of their requests, but sometimes they’ll come to us suddenly asking for new metrics around viewability or bot traffic, etc. We have to try and understand how it’s all working and then make sure that we’re keeping up with all new industry standards. In terms of the industry as a whole, I’d say the biggest challenge is the growth of programmatic. It’s taken off but now publishers are generally making less from advertising. We’ve thankfully been having a great year from good traffic growth and good direct sales, but we’re not living in a bubble; we know that it’s important to come up with new revenue streams. So we are thinking about that, but it’s definitely a challenge to get everyone to agree on what future growth looks like. Can you tell me more about that process? 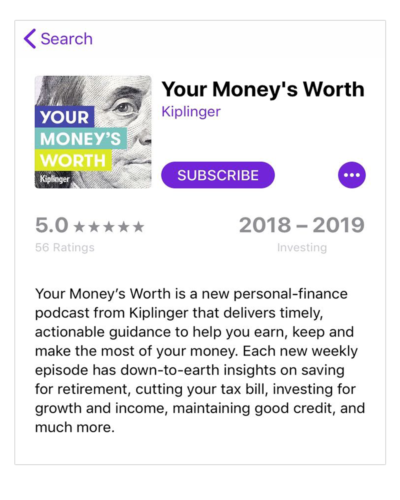 Kiplinger has quite a few revenue streams – from print subscriptions, display advertising, sponsored content, and even a recently launched podcast. How do you decide which initiatives to undertake and how to implement? We try to dip into as many new opportunities as possible without putting a gigantic expense behind it at first. Podcasts, for example: we are dipping our feet in that, but without committing to a lot of technology costs. It’s going pretty well so far. It’s not a huge source of revenue yet, but we’re seeing a lot of downloads and good feedback from both the users and from the advertisers that have run in it. Now we’re working to make this big enough that the revenue justifies all the work that we’re putting into it. A much bigger, more positive, success story for us is native advertising and custom content. Advertisers love it, and we’ve seen huge growth over the last couple years. Two years ago, when we decided to put more effort into this, it represented maybe 3% of our revenue. Now it represents 20-25% on a monthly basis. That’s a revenue stream where we’ve seen huge growth that’s really helping our bottom line. You’re only successful as long as you’re growing, so we have to find ways to keep growing. We’re seeing great success with our email newsletters — ads in those are selling out every month — and our native on-site as well, so we’ll continue to grow those, but we’re also thinking about what new opportunities are out there for us. With the loss of organic traffic, we’ve seen a lot of sites pushing to own their audiences. You mentioned that you’re growing your newsletters, can you tell me more about that? We’ve been very focused on growing our newsletter list. When we compare the email visitors to search or social visitors, the email people engage more with our content. They consume more pages per visit. They spend longer on the site. These are our most dedicated readers and we love catering to them. In the past year or so, we’ve been testing a lot on tablet and mobile, and obviously newsletter readers are more likely to come from a smartphone than other users. We were watching our engagement metrics very closely and it turns out that this group usually consumes about 20-30% more pages per visit than other people coming to our site on a smartphone. Does your team spend a lot of time thinking about the lifetime value of your newsletter subscribers? What does that calculation look like? I’ll start by saying it’s tough to nail down that number precisely because there are a lot of factors involved. When I read that another publication says they know the exact value of one email lead, and it’s $1.56, I know that’s very fuzzy math at best. With our newsletter subscribers, we generate revenue in a few ways. We make money if they click an ad in the newsletter or consume content on our site, so we track the traffic from newsletters very, very closely. We have different code on each of our newsletters and we’re aggressively watching the traffic metrics and ad clicks. So those are the two big revenue buckets from the newsletters that are pretty easy to quantify. But then we also get revenue from readers if they buy a print product, and that’s much harder to measure. Then there’s also times where we don’t know if they’re generating revenue, like if they share content with their family or friends, or if their engagement with our content leads to better search ranking, for example. There’s a lot of analysis, honestly, and it’s tough to get the number to be perfectly exact. What kind of metrics are you tracking around your email audience? We do still think a lot about about time on site, repeat visits, pages per visit. But more recently we’ve also been focusing on email-specific metrics, like growing the open rate and shrinking the opt-out rate. At first, we were very focused on building the email list and getting more people to the site. Now we’re focused on finding the best user experience, not just on the site, but in newsletters as well. In addition to getting people to the site and consuming content, we’re also focused on keeping people on the email list long-term, keeping them happy, and keeping them opening the newsletters and clicking on content. We’re steadily building the daily opens, open rate, and the click-through rate. What do you think is going to be your team’s focus for 2019? We’re going to continue focusing on mobile optimization this year. We’re planning to translate our learnings from smartphones to the tablet experience. We’re also going to work a lot on improving page speed. The first thing is getting every part of the page to load quicker. It improves the viewability of ads, but more importantly, it also improves the user experience. There’s a lot of research that shows that if pages load quicker, people consume more content. We’re also going to continue to grow our newsletter list. We’re shifting marketing spend from one-time visits to capturing emails. We’re seeing that it’s a more effective use of our money. Is there anything you’re personally really excited about? I get really excited about the mobile optimization, honestly. Our staff is in the office, consuming content on our site on a daily basis, but on their laptops and desktops. I’m constantly saying ‘Go look at it on your phone.’ My mom is always on her iPad, that’s how she consumes content. So I’m excited to improve our site to the point where she loves to read it on her iPad. Just because we’re a company that has been around a long time and our audience tends to skew older, doesn’t mean we can forget there are people out there that want to read our content on every device. Last, but not least: Kiplinger has been a Keywee customer for quite a while — can you tell me a bit about your experience working with Keywee? Yes, we love Keywee! We tested doing some paid spend on Facebook internally, and it didn’t work. We just couldn’t get it to be affordable. My business development person suggested we look into Keywee and I remember thinking ‘If we couldn’t get it to work on our own, how is this going to work with Keywee’s fee on top of our spend?’ But it really, really works. Keywee’s fee is more than made up by the savings that we get. We just don’t have the time and energy and expertise in-house to know how to optimize in the way that Keywee does. Keywee has also been great at guiding us on new initiatives that publishers are doing. We do our best to keep up to date about new opportunities, but we don’t always know whether new ideas would work out, or how we’d go about trying them. Keywee brings us new opportunities, sometimes before we even hear about them, which is great. If we hadn’t found Keywee, I don’t think we ever would have ended up spending on Facebook. Thanks so much for taking the time to chat with us, Andy, and for sharing your expertise in the world of revenue and operations. 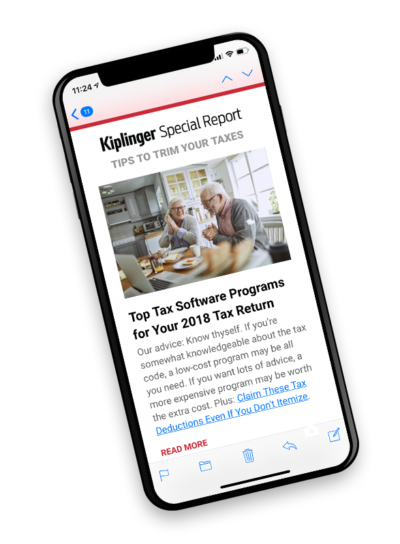 We look forward to watching Kiplinger’s exciting growth in 2019! Editor’s Note: After 99 years under the leadership of the Kiplinger family, Kiplinger’s publishing business was recently acquired by Dennis Publishing. There have been no major staff changes following the acquisition. Andy and his team are very excited about the growth opportunities that being part of the Dennis portfolio will provide. We, however, did not discuss details of the acquisition in our interview with Andy.